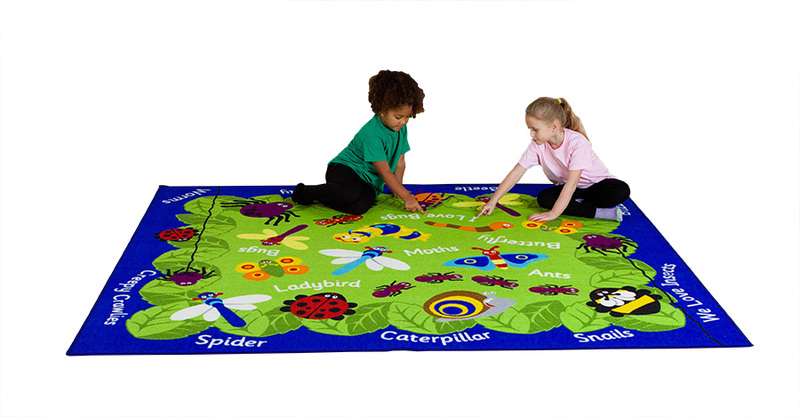 Our Back to Nature Minibeasts classroom carpet is a fun and interactive learning rug which promotes group play and group discussions about nature in our environment. The rectangular classroom carpet has been designed with comfort and fun in mind, ideal for use in schools, pre-schools and nurseries. With its brightly coloured and distinctive illustrations, the minibeasts classroom rug has been designed to encourage learning through interactive and imaginative play. The Back to Nature Minibeasts classroom rug comes with a 1 year manufacturer’s warranty and conforms to relevant safety standards EN71 Parts 1, 2 and 3.